Home › Apparel › What are the Best Golf Hats? 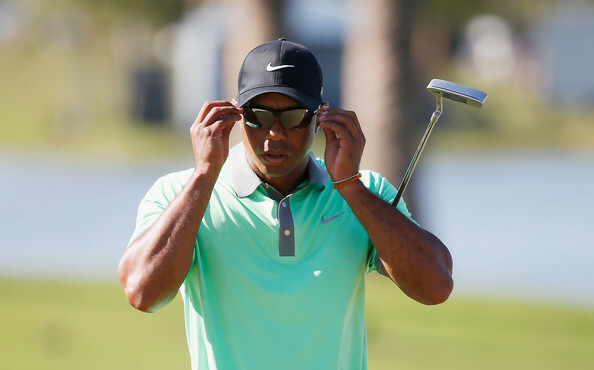 To further protect your eyes, match your hat with a pair of the best golf sunglasses! Taylormade is long standing brand in the golf world, and is trusted by tour players like Sergio Garcia, Dustin Johnson, and Dustin Rose. The Tour Split Hat is one of TaylorMade’s most popular hat models available. It is made from 100% Polyester for strong durability while also providing excellent ventilation. It has a superb adjustable back strap to ensure that it will not only fit you, but also your friend with the big head. The multi textured performance moisture wicking fabric will keep you cool and prevent your head getting soaked in sweat. An added feature that actually enhances its benefits is the dark underbill that can help reduce the glare of ambient light outside for you to better get a view of the golf course. This is one of the best golf hats for UV protection — the fabric is rated 50 UPF (Ultraviolet Protection Factor), meaning it will block over 97.5% of UV radiation. The Tour Split Hat is available in a few different colorways, so you can pick one (or two) that suit your style. The black style is currently available for over 60% off (on Amazon). Get yours quick! 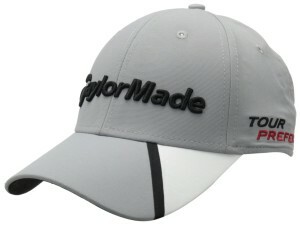 Buy the TaylorMade Tour Split Hat here! Are you one of those crazies who play rain or shine? 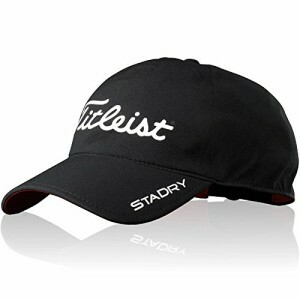 Then the StaDry from Titleist is the best golf hat for you. Although Titleist is more known as a golf ball brand, they also make other great products…like hats! This particular model is part of their new StaDry Collection for 2015 (hats, bags, and umbrellas). As you may have guessed, this cap is made from waterproof material to help keep you head warm and dry when you play on rainy days. It uses a clean, simple black design that looks great and matches almost any outfit. If you are not a fan of the basic baseball cap style, then you can also check out the bucket hat version. This is a brand new golf hat from Titleist and it is already garnering great reviews from golfers around the world. Since it is brand new model though, it is also a tad bit expensie at around $30. 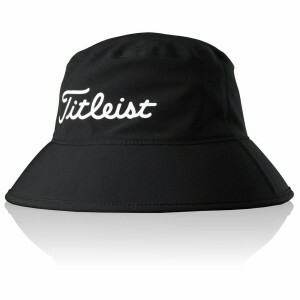 Buy the Titleist StaDry Waterproof Golf Hat here! Check out the Bucket Hat version here! Ah, here we go. 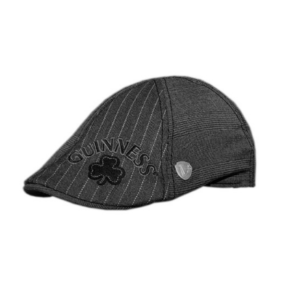 The Guinness Ivy Cap just exudes the classic golfer look. The old fashion “Jeff” or ivy cap gets a breath of fresh air thanks to the Guinness brand (yes, the beer). This expertly made golf cap is made of high quality materials and fits perfectly and comfortably on your head. The Ivy Cap is perfect when playing in cooler climates and will surely draw compliments from your friends and other golfers. The downside is it doesn’t offer much sun protection, waterproof, or other high tech features of modern style caps. 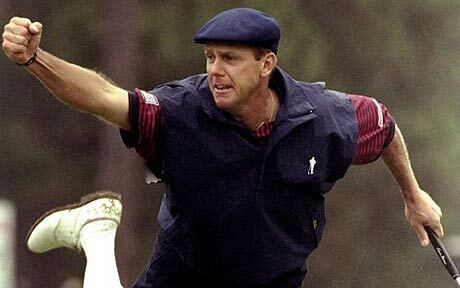 But, if you’re into the classic, retro look, then this is definitely one of the best golf hats available for you. Buy the Guiness Ivy Cap here! Swoosh! Nike has been on top of the sports technology and apparel world for the past couple of decades so it’s no surprise that one of their golf caps made our list. In fact, we could’ve filled this list with just Nike hats, but we thought we’d limit it to one spot per brand. The Nike Golf Swoosh Front Cap is definitely one of the best golf hats that we have today based solely quality and customer satisfaction. The hat is made of Nike’s signature Dri-Fit microfiber/polyester material which helps keep the hat lightweight, cool, and comfortable, even on the hottest summer days. It is so light, you will sometimes forget that you’re even wearing it! The cap is one-size-fits-all, and has a hidden adjustable strap at the back so you can customize fit to your head. As an added bonus, the cap is machine washable, and won’t fade color even after multiple washes. This is easily one of the best golf hats on the market, and our favorite out of Nike’s selections. It comes in a multitude of colors (red, blue, white, black, etc), so you can pick one to match your style. You definitely will not be disappointed with your purchase of the Nike Golf Tech Swoosh Cap. 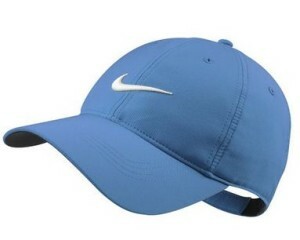 Buy the Nike Golf Tech Swoosh Cap here! Fan of the Shark (a.k.a Greg Norman)? Young bloods may not remember, but this was Norman’s signature style hat back when he was #1 in the world. It uses lightweight Toyo Straw material with a ventilated top to keep your head cool and comfortable under the blistering sun. Its wide 360 degree brim/visor will help protect your face and eyes, as well as the back of your neck. The hat is “one size fits all”– the underside has an elastic band that will stretch to your head — but it may not fit well for people with extremely small heads. It is a bit more expensive than your standard golf cap, but this hat is definitely an attention grabber, so if you want to stand out from the crown, then give it a try. You may start to love it! It is available in two colors (straw, or black). Don’t wear it in the rain! Buy the Greg Norman Signature Straw Hat here! 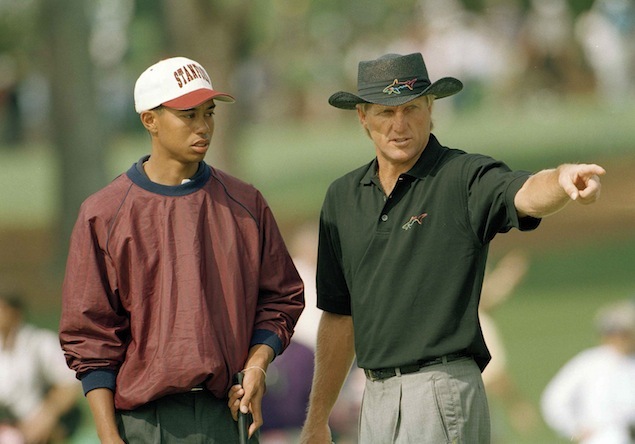 Greg Norman in his signature hat schooling a young Tiger Woods. The best golf hats not only look good, but will keep your head cool and dry so you can focus on the course. As any golfer knows, keeping a cool head can be the key to cut a few strokes off your score! ‹ What is the Best Divot Repair Tool?